This workshop is available for students going into MAT 101. Students will have an opportunity to review basic math functions and problem solving techniques. Light refreshments will be served. Saturdays - March 6 (Room 39), May 1 (Room 49), or June 26 (Room 49) - 9 a.m. to 12 p.m. This workshop is available for students who have completed MAT 109 and would like an opportunity to refresh the fundamental skills required for MAT 210. Light refreshments will be served. This workshop is available for students going into ENG 101. Students will have an opportunity to review basic essay writing techniques. Light refreshments will be served. Saturdays - May 15 (Room 43) or June 19 (Room 59) - 11 a.m. to 1 p.m. This writing workshop is available for students who have successfully completed ENG 101 and would like to continue to improve their writing skills. Students will have an opportunity to strengthen their skills in the areas of MLA citation and research. Light refreshments will be served. In this workshop, students have the opportunity to learn how to use the computers and applications of Peirce College, or if you are a beginner, we can teach you how to get started. This workshop is broken down into two sessions -- feel free to sign up for one or both! You decide which session works for you. 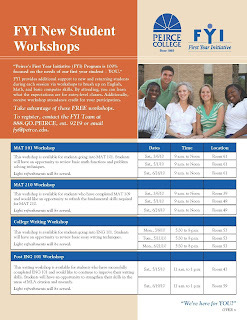 For full details, including time and location, check out the FYI flyer and be sure to keep an eye out for updates on the calendar, which students can access by logging on to my.peirce.edu and clicking on the New Students tab. We'll be using the blog to share information about everything the program offers, so be sure to stay tuned. In the meantime, keep thinking warm thoughts!